Joget is a software product company that develops and manages a commercial open source web application development platform called Joget Workflow. 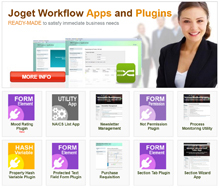 Joget Workflow simplifies and eases the development of enterprise web application and automation of processes. With the help of our community and our partners, we aim to make Joget Workflow meet the expectations of anyone who needs to deliver solutions to their customers quickly or to build custom solutions to meet their own needs.